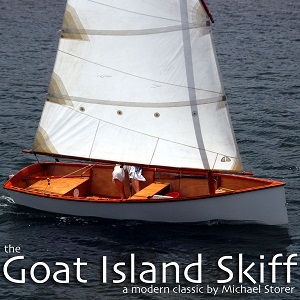 Where does one start about the Goat Island Skiff? I became attracted to the GIS because of its simplicity and focus on performance. I wanted to know more about designing and building lightweight craft and I wanted something fairly quick to build. I wanted to go sailing! I prototyped the GIS kit in 2010 and still sail and row my Goat today. There is a wide GIS community on the web and enough resources about the boat to help anyone complete their project. My GIS focus has been to develop the kit and test a new yawl rig. I just about never sail without the mizzen. This arrangement makes her into a small sail-&-oar boat, more friendly for singlehanding, maneuvering and reefing underway, and switching from sailing to rowing mode, and back again. Mostly I sail, but the skiff rows okay given her light weight. The interior offers a lot of space for a small boat because of the boxy skiff construction. Freeboard is ample on the boat and helps to create some security. That said, the GIS will present the new sailor a good learning curve and will continue to delight as your experience grows. This has been my experience. The kit builds without any need for a strongback by attaching the side panels at the bow, engaging side panels and bulkheads with the tabs and slots, and fastening to the transom. The bottom goes on like a lid after the chine logs. The interior accepts the precut tank tops and seats included in the kit. There is no specific kit for the yawl, rather it is a modification that the builder makes to take the mizzen mast and to move the main mast position aft. Specific instructions and a drawing is included with the kit. Plans come straight from the designer, Michael Storer.